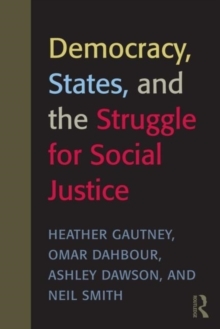 Democracy, States, and the Struggle for Social Justice draws on the fields of geography, political theory, and cultural studies to analyze experiments with novel forms of democracy, highlighting the critical issue of the changing nature of the state and citizenship in the contemporary political landscape as they are buffeted by countervailing forces of corporate globalization and participatory politics. Using interesting case studies, the book explores these 3 main themes:the meaning of radical democracy in light of recent developments in democratic theorynew spatial arrangements or scales of democracy - from local to global, from streets protests to the development of transnational networksthe character and role of states in the development of new forms of democracyThe book asks and answers: are participatory models of democracy viable alternatives in their own right or are they best understood as supplemental to traditional representative democracy? What are the conditions that give rise to the development of such models and are they equally effective at every scale; i.e., do they only realize their radical potential in particular, local places?A useful text in a broad range of advanced undergraduate courses including social movements, political sociology or geography, political philosophy.